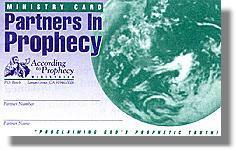 What is the Partners In Prophecy Program? The Partners in Prophecy Program was created to help According To Prophecy Ministries with a basis of steady financial support. This steady support will allow the Ministry to do more for the Body of Christ and this dying world. Your support will enable this minisrty to finance many endeavors which the Lord has laid on the heart of Evangelist Donald Perkins. Some of these financial endeavors include the growing costs of maintaining all of the ministry's literature such as the According To Prophecy newsletter, TV and radio programs, Bible Prophecy Conferences and our worldwide website. Your support will also make it possible to continue to send out free products to those who call or contact us in response to the minstry's programs. Those of you who become members of our Partners in Prophecy Program will have a major part in proclaiming God's Prophetic Truth for the last days! What are my benefits for becoming a Partners In Prophecy? A tape of the month from Evangelist Donald Perkins or a colleague in Prophecy. A Partners In Prophecy Ministry Card that will allow each Partner to recieve special discounts on ministry study material. Update letters on the status and work of this ministry. A general year-end ministry financial report. Advance notices of new ministry study material. Special gifts from time to time as recognition of your sacrificial giving. As a Partner In Prophecy member you are helping Evangelist Donald Perkins to reach this generation for Christ. All who are saved as a result of your giving will be credited to your account in Heaven. 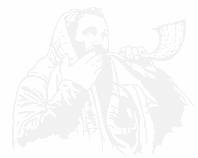 Join with us as a Partner In Prophecy member today. We need your faithful suport! How do I become a Partners In Prophecy Member? According To Prophecy Ministries needs new partners to join with us as Partners In Prophecy. Those who become Partners In Prophecy are those who pledge to support According To Prophecy Ministries with at least a $25.00 pledge per month or more, for one year. If you would like to become a Partners In Prophecy member, please click on the desired amount you want to give per month, and follow the prompts after that and you will become a partner with us to Proclaim God's Prophetic Truth!, to a lost and hurting world. Please pray about what your part may be in support of According To Prophecy Ministries.